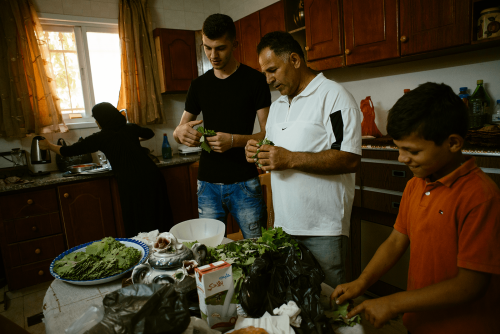 Businesswoman Sumaia Sawalmeh relies on the support of her husband to balance her work while raising her family of five in rural West Bank. Plates filled with Manakish, warmed pita, Nutella cake balls, and salty Akkawi cheese sit on her coffee table. Crystal glasses set on a silver tray brim with black tea and floating mint leaves. A spoon for sugar is dropped into each. Teased by a pull on her head covering, Sumaia spins and lifts youngest daughter Sara Rawagabeh, 4, onto her lap. She raises her five children with her husband Ammar Rawagabeh, 46. He crafts furniture. She grows olives. Together, they keep bees. 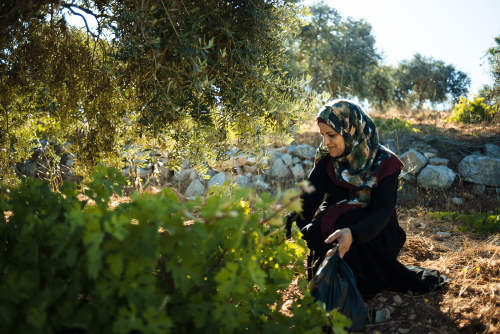 In 2011, she entered the USAID and Near East Foundation’s Olive Oil Without Borders program. Training and funds allowed her to advance her farming techniques and certify as an olive oil taster—a skill used to determine the oil’s grade. 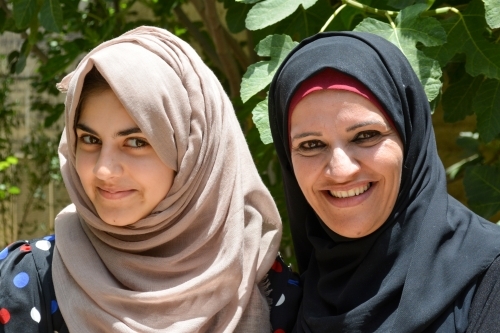 She also received NEF grants to buy two beekeeping cells for honey through her participation in NEF’s Advancing Women’s Business in the Palestinian Territories project. 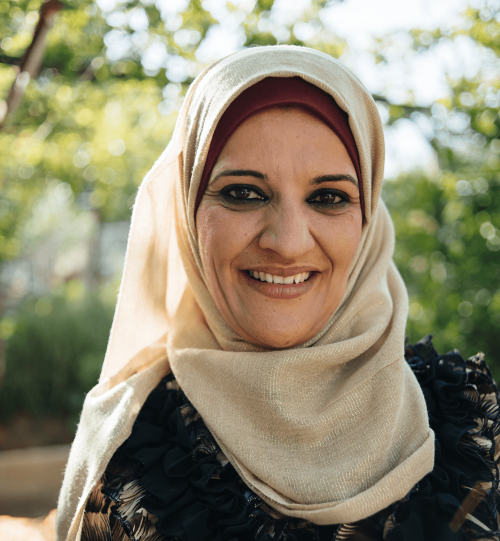 Sumaia leverages her own independence and Ammar’s support to pursue her own business ventures. 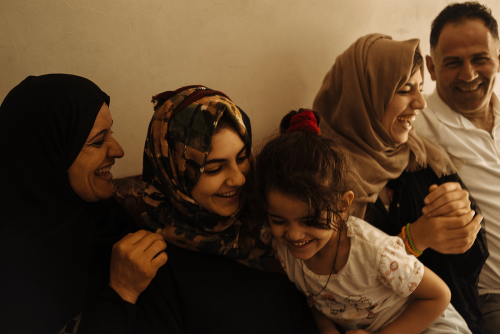 Tradition in Middle Eastern culture can keep women in roles exclusive to raising a family and caring for the household. For Sumaia, entering into business for herself was a means to increase her family’s income. It also allowed her to use the business knowledge she learned while studying computer engineering in Jordan for two years before she set that aside to get married. Two white suits with mesh-covered hats have been set out on Sumaia’s patio table. Each protects from bee stings. One covers the entire body, the other just to the waist. Sumaia reaches for the longer suit—she’s allergic to bee stings. Ammar assist her with ensuring that every gap between Sumaia’s hat and her suit are sealed. His demanding schedule required that Sumaia handle much of the family tasks at home. So, her desire to farm challenged their routine, he says. But he learned how her ambitions gave back to their family and children. Beekeeping came later, when Sumaia found out about the grants available through NEF. She applied to add another source of income. Her allergy prevents her from handling the cells alone, though. So, Ammar researched techniques. He took over and expanded their two cells to seven. 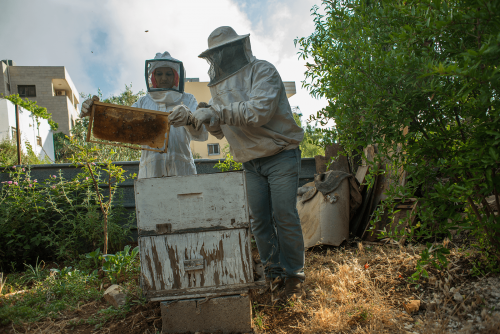 They collect about 20 to 50 kilograms of honey each year to sell at local markets. Whatever the project, they take it on side-by-side, he says. Sumaia’s freedom as a businesswoman shows her children, especially her daughters, the opportunities beyond Asira. She and Ammar teach them about their family land. But they want the five children to get their educations, maybe a doctorate, and then hopefully, return home.